If we haven’t yet expressed our unconditional love for the Boardwalk area at Walt Disney World, let me say it a little louder. 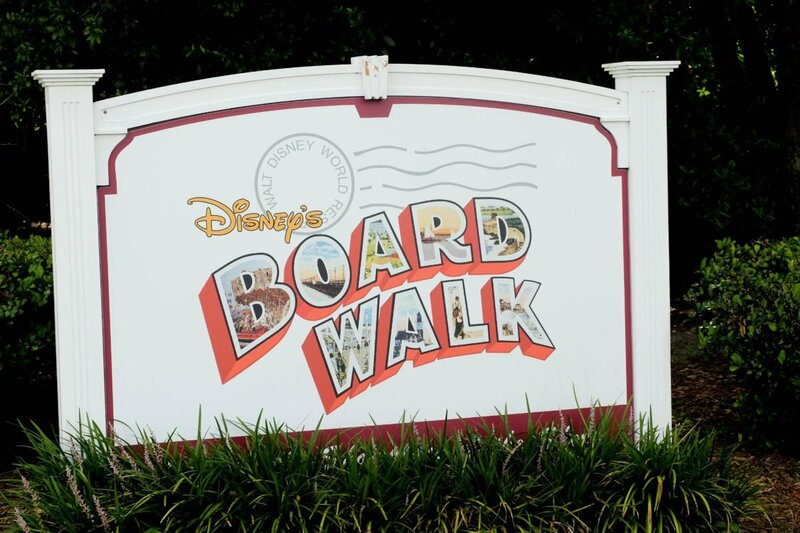 We LOVE the Boardwalk area of Walt Disney World. There, now we have that out of the way. One of the biggest reasons we love this area is because of the fun, chill vibe here. 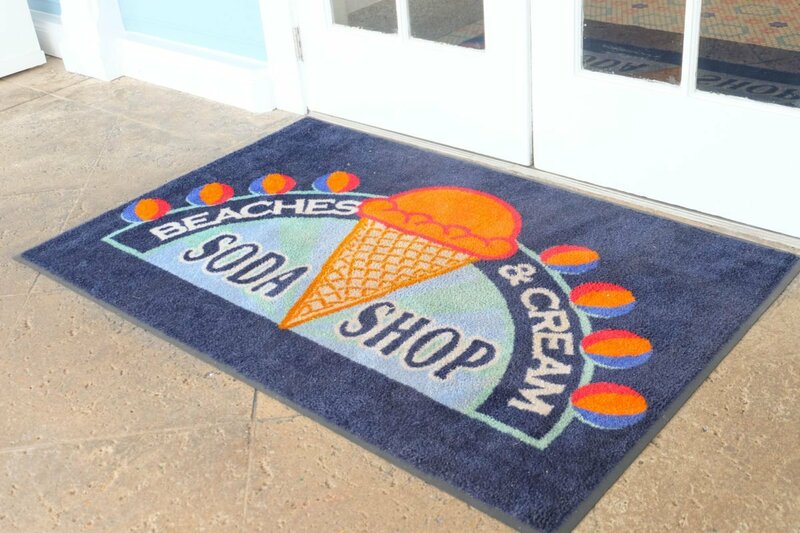 We are always exploring new places to stay, have fun, and eat which brings us to the Beaches & Cream Soda Shop. 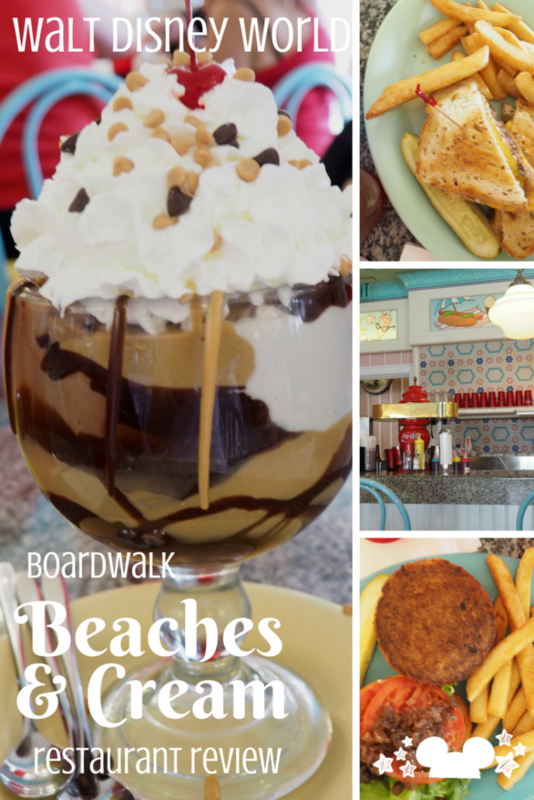 Beaches & Cream is located at the Beach Club, which is potentially our favorite resort on the Boardwalk.We had seen pictures of the cute, 50’s style little diner that served ice cream which was just darling, but since you needed reservations just hadn’t had the chance to try it! Since we were staying at The Boardwalk Inn this trip, we decided it was the best time to take advantage of our location and make lunch reservations for this adorable little diner. Because, yes, they also have lunch. Let me start by saying- reservations are definitely recommended for this place. Reservations are a little hard to get, but only because it is so tiny. We recommend looking for reservations ASAP and if there aren’t any available keep checking leading up to your trip. 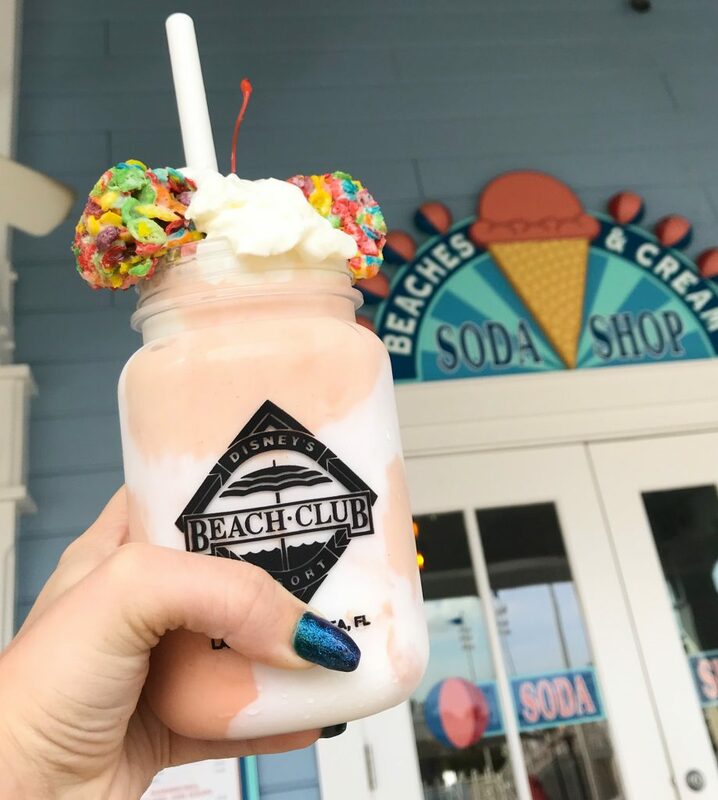 We’ve seen last minute reservations pop up for Beaches & Cream a lot, so just keep trying and you might be able to snag one! We’ve gotten reservations twice now the day of, sometimes it just works out! Can’t get a reservation? Sometimes you can ask to wait(expect to wait a couple hours) and sometimes there might be a seat open at the bar. Just ask! They’ll let you know what they can accommodate. 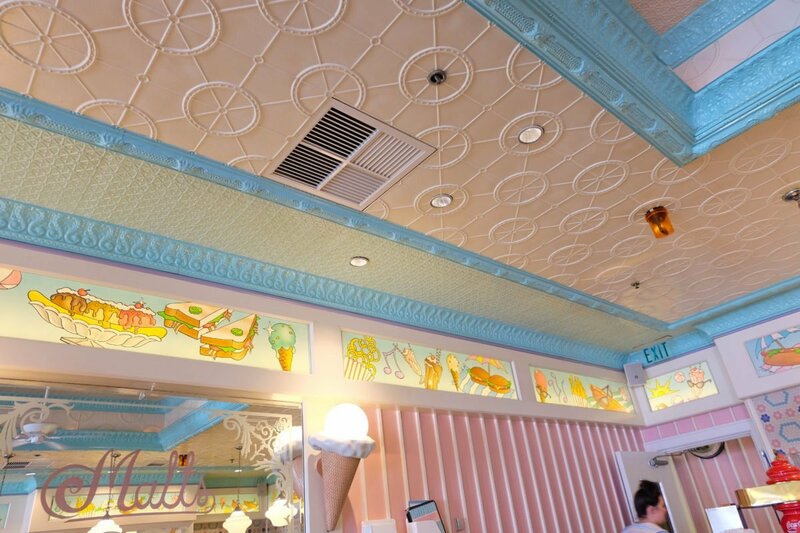 The food at Beaches & Cream is actually pretty standard diner food. Burgers, sandwiches, fries and the main reason you go here- lots of ice cream. 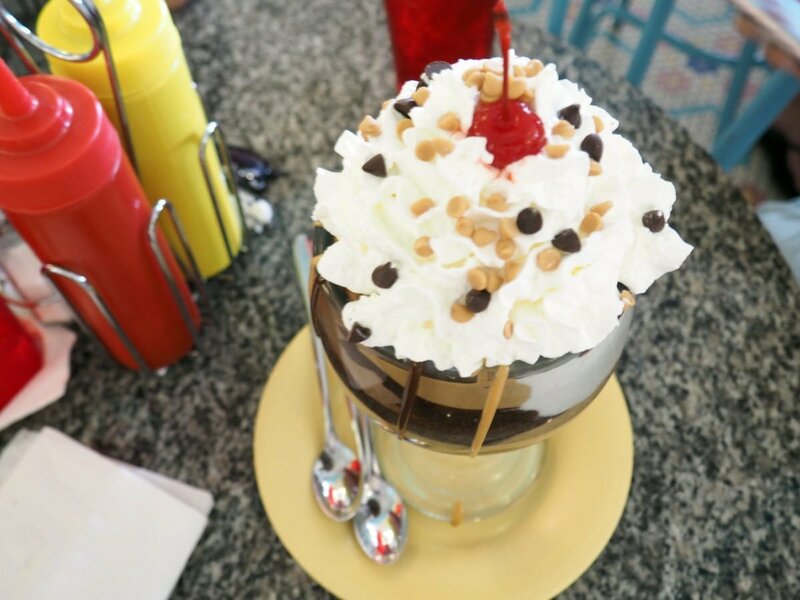 Ice Cream in the form of sundaes, milkshakes and malts. If you’re not an ice cream lover, never fear, they have non-ice cream desserts here as well. 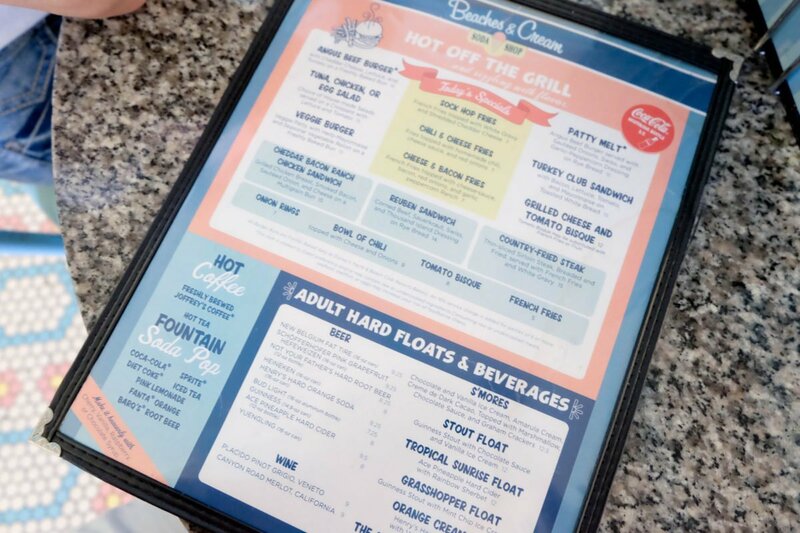 The restaurant also serves alcohol, including “adult” floats, so if you’re in need of an adult beverage, you can find lots of fun options here. And the showstopper guys, is the KITCHEN SINK. 7 scoops of ice cream, every topping in the house, and WHOLE CAN of whipped cream. A whole can? Yes! A whole can. It says its serves 4. I beg to differ. I don’t know, after seeing several of these being served(and yes they do make a big deal about it) I would argue that number. Like 4 what?! 4 people who haven’t eaten in a week? Its big. Like REALLY big. I would actually guess it could easily serve 8. However, that being said, if you have a party of 4 who can eat it, I commend you! For our lunch, we ordered the Patty Melt and the Veggie Burger. 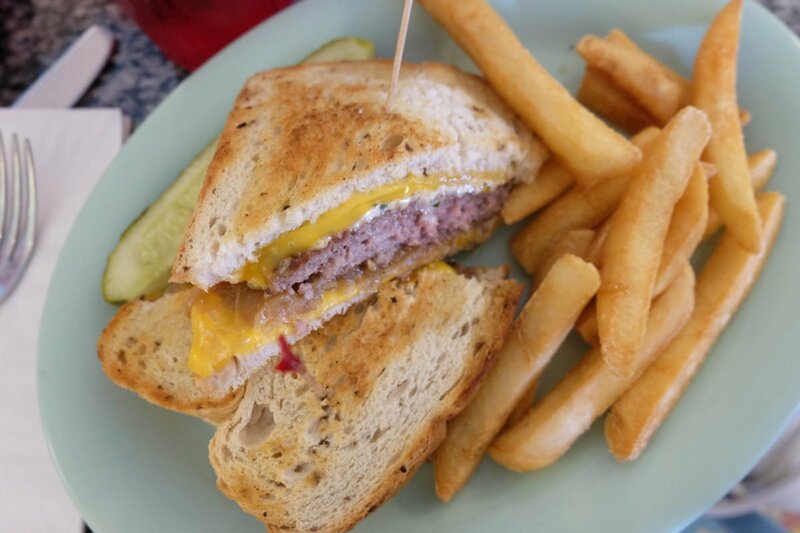 The Patty Melt was really great and we would definitely get it again. 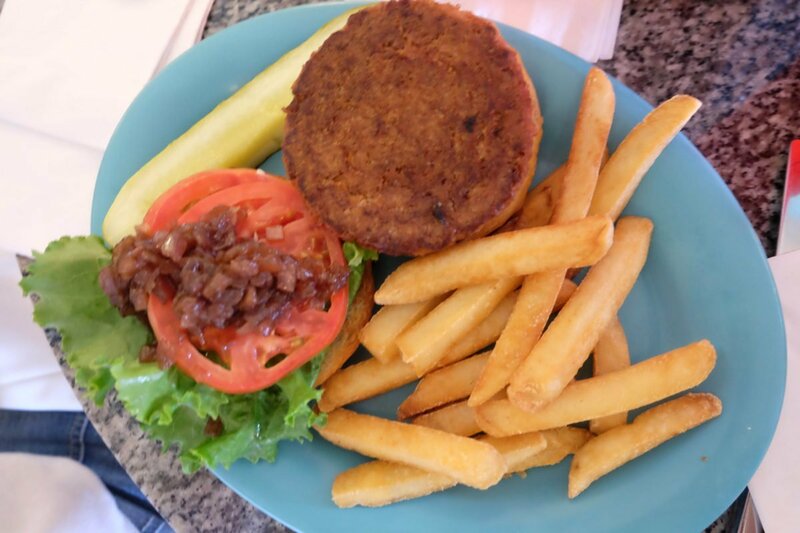 The Veggie burger was good, but nothing special. Again, standard diner fare and as long as you’re not expecting much more, you won’t be disappointed. We’ve also had the onion rings, which are huge and delicious. If you’re an onion ring fan, we highly recommend these. 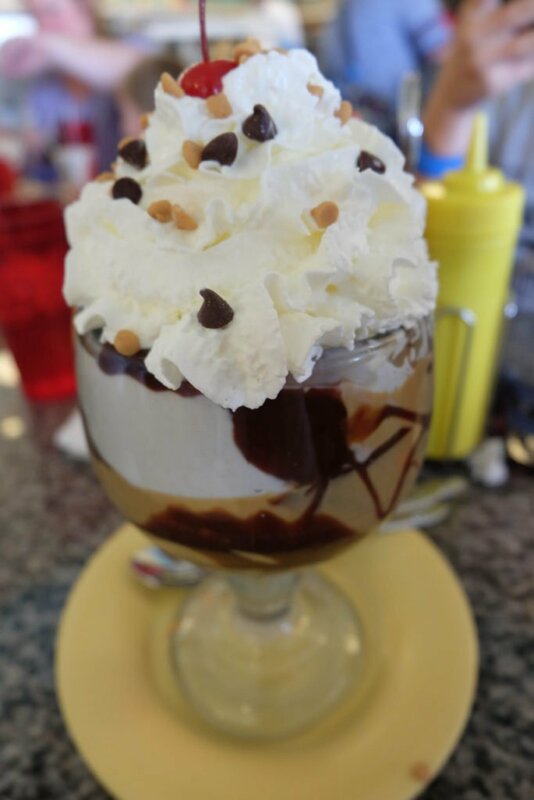 We also got the No Way Jose, which is hot fudge and peanut butter-yum. So good. You come here for the ice cream and it is delicious. And also huge- feel free to share your sundaes if you’re also getting a meal. Aside from ice cream and sundaes, they also have milkshakes! 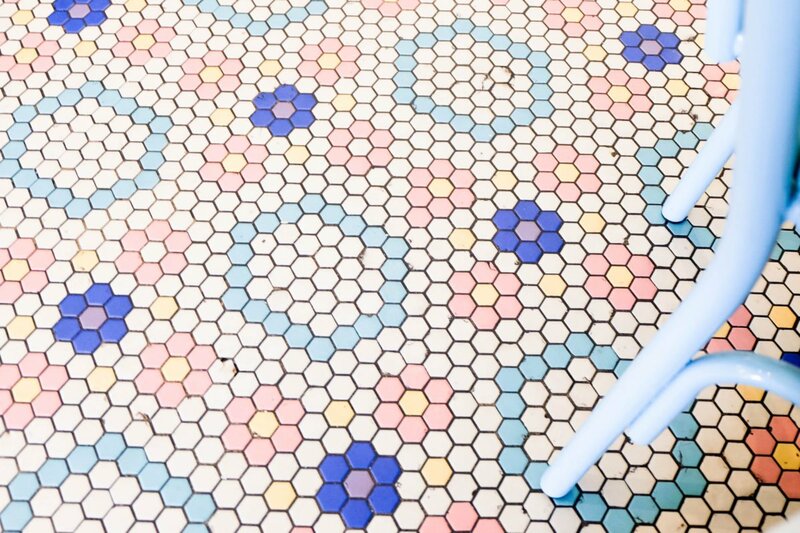 And the newest milkshakes are so fun, you’ll want to try them all. 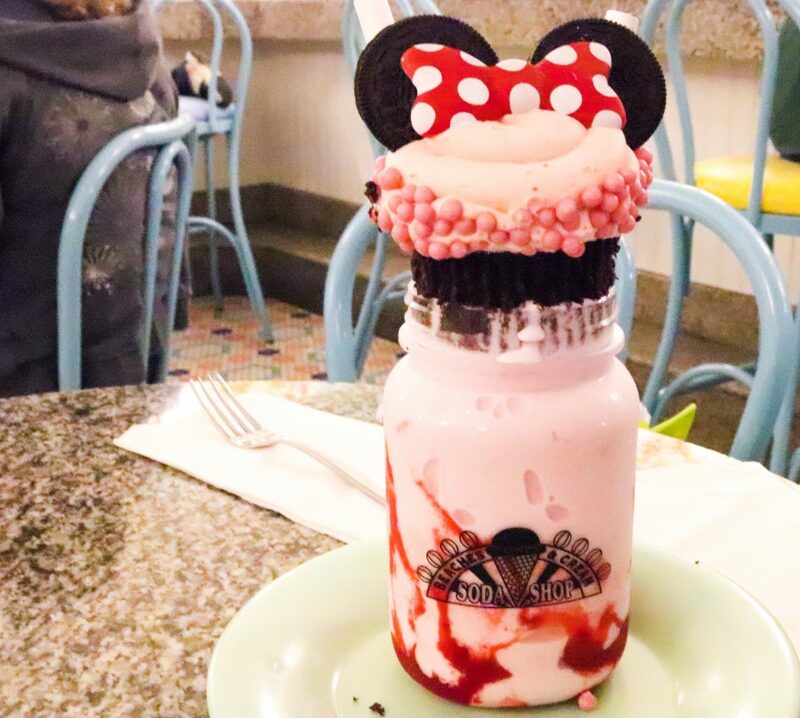 These giant milkshakes are not only milkshakes, they’re also dessert! Choose between Strawberry with a chocolate cupcake, vanilla topped with an iced funfetti cupcake, chocolate shake with a brownie on top and a orange creamsicle shake with fruit pebble treats for ears! We’ve tried two so far and they are delicious and definitely big enough to share… if you’re feeling generous. 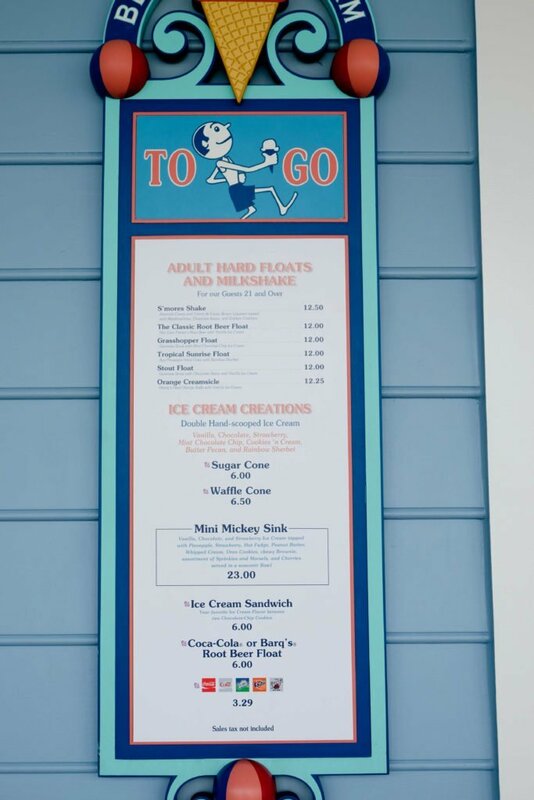 Tip: If you just want the ice cream and don’t want to eat in, they have a to go menu too! Just walk up to the to go counter, place your order and enjoy the view of the Beach Club’s gorgeous pool. 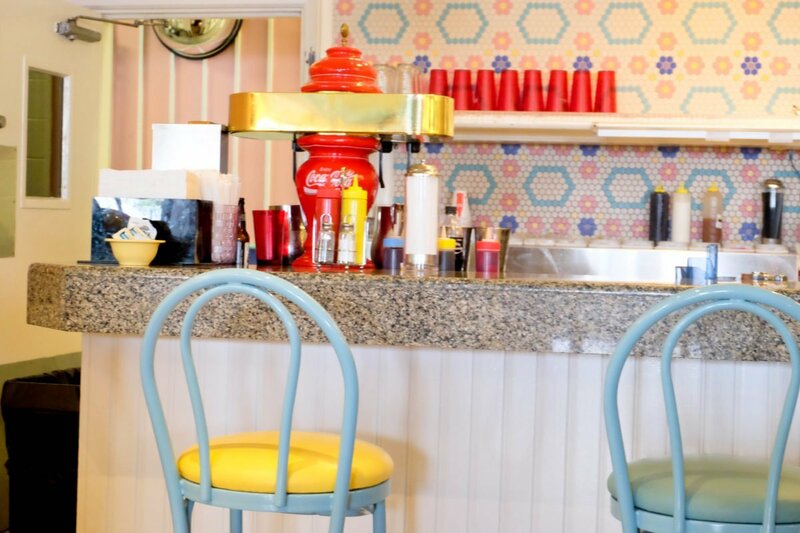 As I had mentioned before, it is a 50’s style soda shop. Super fun! 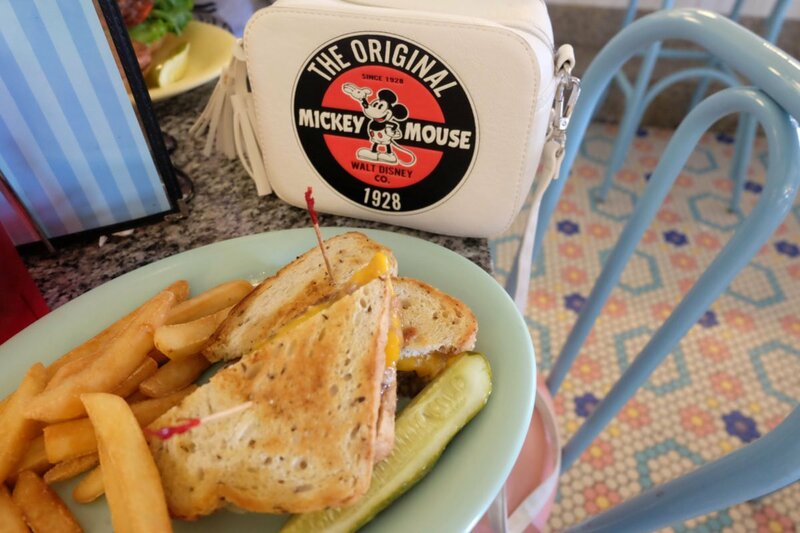 Complete with a juke box, pretty pastels and even the servers dressed the part in true Disney fashion, the atmosphere will transport you back in time! The servers are loud and fun, so if you’re looking for peace, this is not the place! I feel the need to reiterate: this place is small. Which means you could potentially be sitting very close to another family if you are seated in the middle row like we were. Just be aware. All in all, we loved it. 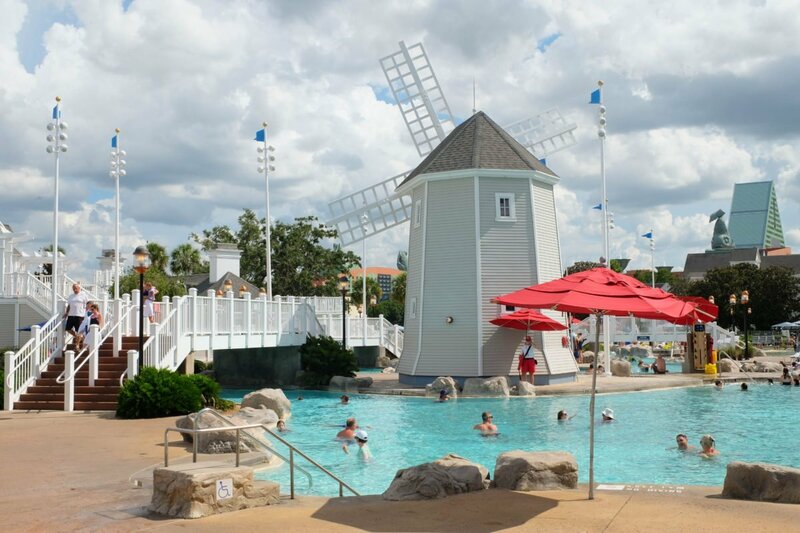 Beaches & Cream is a fun little spot to grab a casual meal. 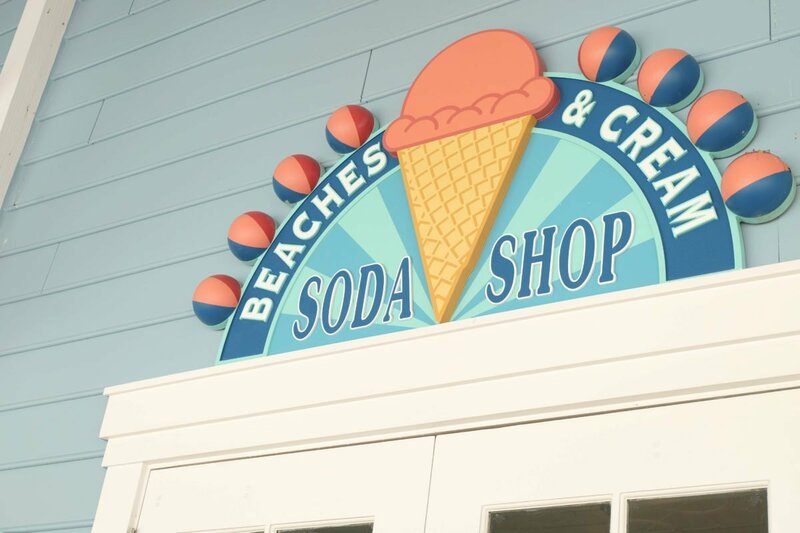 The servers are great, the ice cream is great but most importantly, it gives you another reason to spend some time on the Boardwalk.